Place everything but the seeds in a mini blender and blend until smooth. 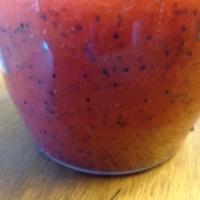 Pour into a glass container and add seeds. Let rest on counter for an hour and then place in fridge. I serve this over 2 oz of baby spinach, a handful of dried cranberries and 2 tbs of roasted nuts. I like pine nuts but they are very expensive so I usually use a combo of pine nuts, slivered almonds and pumpkin seeds. Taste before serving, you may need more honey depending on how sweet/tart your strawberries are. That is so pretty! What a great idea!!!! This sounds so delicious Bren!! Like gaspesiangal's recipes? Never miss an upload!